SUP 1st DESCENT ON THE ZAMBEZI?! ~ Interviewing Team Standup4Rhinos. by Mike Toughill | DBP MAGAZINE ONLINE The World's Best Free Whitewater Publication. Sometimes giving back means receiving blessings too. 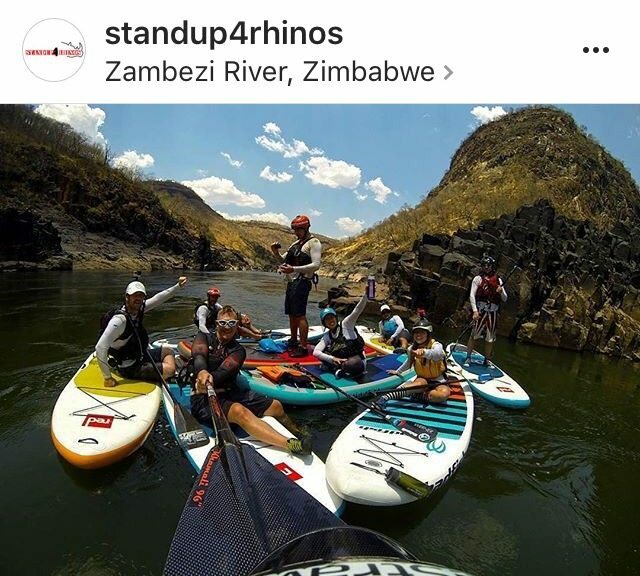 That is what happened a few weeks back when DBP Admin Paul Teasdale and his friends tackled one of the most famous rivers in the world, the Zambezi of Africa, on stand up paddle boards. Gracing the cover of this month’s issue, they formed a team: Standup4Rhinos. The cause is wonderful, and the challenges, and rewards, were great. I got a chance to catch up with Paul and team members Shane Raw, Bertrand van der Berg, Andrew Kellett, and Leon Pieters from South Africa along with Nadia Almuti and Brittany Parker of the USA to ask them about the experience. 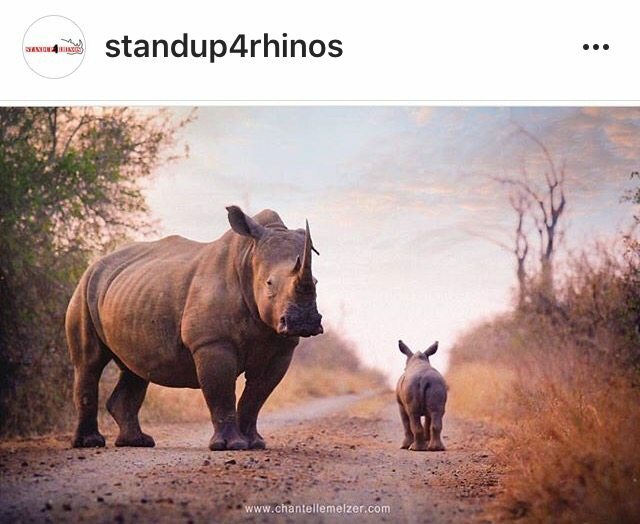 The photos are courtesy of Standup4Rhinos on Instagram @standup4rhinos, give them a follow! 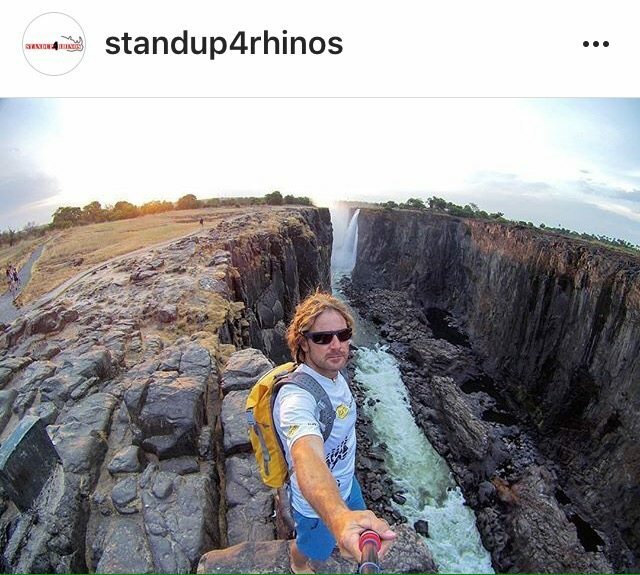 DBP: Paul, as the founder of RAW Adrenaline you’ve been involved with some pretty fascinating projects, but nothing quite like Standup4Rhinos. Please give a brief overview of the project and what inspired you to undertake SUPping the Zambezi? PAUL: This all started over a year ago….Shane and I had been planning something completely different but had to postpone for various reasons. 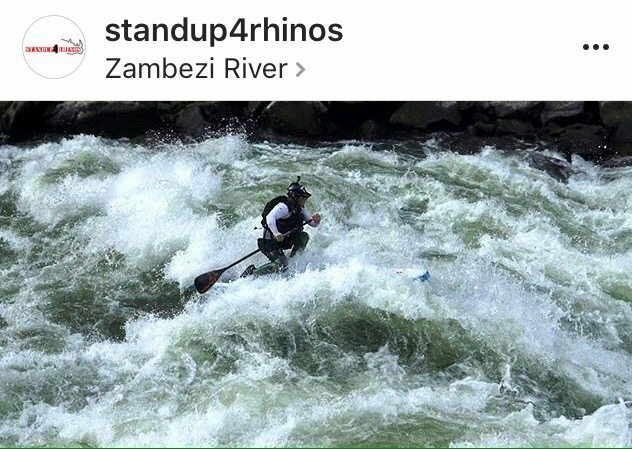 We had been discussing the project with Bertrand when Bertrand asked if anyone had attempted to SUP the Zambezi Rapids…. Shane and I pretty much laughed at the notion, especially since we are not SUPers by any manner or means. Bertrand is a SUPer and pushed the issue a little and the three of us decided that it would be interesting to give it a try. We also realised that it was a bit of a tall order, and as a result we decided that we wanted to do it for something bigger than ourselves. 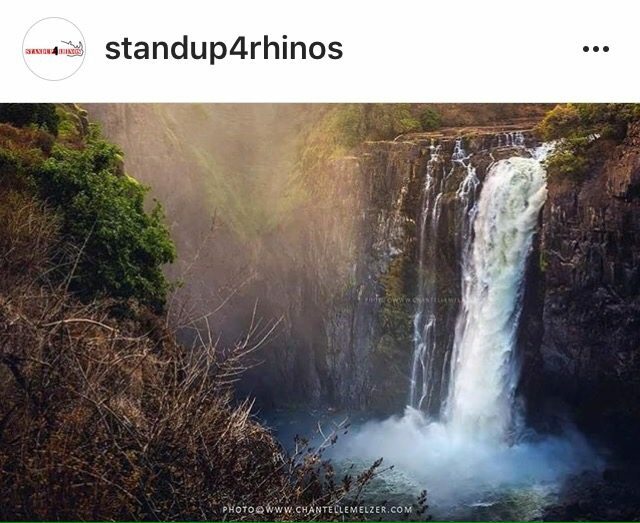 Shane and Chantelle had recently been doing a photographic project that was raising awareness for rhino conservation and this cause was very close to their hearts, so we decided to raise money for the Care for Wild Rhino Orphanage, and Standup4Rhinos was born. This really was Shane’s project more than anybody, and he was the main driving force behind the whole thing. My job was more support and logistics. Shane really put a lot of work into making this project a success and he really deserves all the credit. That being said, every team member contributed greatly in different ways and I don’t think it would have been the same if we had left out a single one. DBP: What did you hope to achieve through the StandUp4Rhinos project? SHANE: Well when Bertrand first mentioned the idea of SUPing the Zambezi to me, I couldn’t believe it had never been done. Without stopping to think what we might be getting ourselves into, or the fact that it might require me to actually stand up on a stand-up paddleboard and attempt to paddle it down some of the biggest whitewater on the planet… I agreed that it had to be done asap! There are really only a handful of whitewater SUPers in South Africa so putting together a team wasn’t that hard, especially when you dangle a first descent tag as a carrot. Then we decided we’d better have someone with some experience so we got Nadia and Brittany in on it and they have been absolute stars – such a privilege to have them on the team. PAUL: Once Shane, Bertrand and I had agreed that we were gonna give this a shot we also agreed that we should invite some others. The obvious place to start was with SUP paddlers that were already RAWHeroes. So we approached Brittany, Nadia and Philip. From there we also got Leon on board. Later, Andrew Kellet got wind of what we were up to and showed interest so we welcomed him, knowing that he would be an incredible asset for many reasons including his immense experience in the whitewater world. It was such an amazing team actually, and I would like to take this opportunity to thank them all for everything they contributed. SHANE: When it came to giving the project a purpose… a soul if you like, well, there are few more deserving causes than the plight of these orphaned baby rhino that end up at the Care for Wild Rhino Sanctuary. Chantelle and I had recently visited Care for Wild and it was absolutely tragic to think that every baby rhino there represented a mother that had been brutally slaughtered for her horn… and that is really only the tip of the iceberg of the poaching scourge decimating rhino populations in Southern Africa right now. So our purpose became to raise awareness of the seriousness and horrific nature of the problem and to provide meaningful financial support to Care for Wild for the selfless work that they do in rescuing and looking after these incredible animals. DBP: The mission was a success! But there is still more to be done. How much money has been contributed to Care for Wild Africa Rhino Sanctuary NPC, and how can our readers help? DBP: For those of you who travelled long distances to the Zambezi, what was the journey like? What was the most challenging aspect? SHANE: The majority of the team is from South Africa so we didn’t have as far to travel as the girls from the US and A – it’s actually a pretty painless 2 hour flight from Joberg. One notably scary thing though, is that due to the prolonged and severe drought that has left large parts of Southern Africa completely parched, for most of the year the Zambezi was the nearest flowing water – around 2000 km away – from where I live in South Africa! Bleak times to be a kayaker!! BERTRAND: It was fun (read lots of admin and explaining) to cross the border from Zambia to Zimbabwe with all our kit. This included swapping cars a few times. LEON: Just dealing with all the gear, getting it checked in, keeping it from falling off the trolley in airport every 2 meters, that type of thing was a challenge. And having to pay for excess baggage. BRITTANY: Nadia and I traveled from Colorado in the US. We had two connections on our way there which amounted to a total of 24 hours of travel time. I’m terrible at sleeping on planes and slept about three hours total. By the time we landed in Zambia I was delirious… to be honest I don’t really remember much of the drive across the border just that I wanted to find a bed ASAP. The most challenging part regarding the traveling was the jet lag. I think I was finally adjusted to the time difference after being there for a week which was as long as we were in Vic Falls. I never woke up feeling rested. NADIA: The journey from the states was filled with excitement to what we were about to do, not really knowing what to expect. I’ve never traveled to Africa so I was excited to see a new culture, eat new food, and most important paddle new rivers. DBP: The Batoka Gorge looks simply stunning, especially in the photos taken of the mission by Chantelle Melzer. What was it like to be surrounded by such natural beauty? SHANE: Well, in addition to being so beautiful, she’s a really awesome person and talented artist too!! Oh wait… you mean the gorge… I guess the best way to describe the beauty of the Batoka Gorge is raw and rugged,especially at the that time of year (October / November) due to the suffocating heat and dryness before the rains come in December. These were pretty challenging conditions to operate in but it made us really appreciate the cool, clear, deep waters of the Zambezi! Sometimes I bailed off the board just to cool down… well that’s my story anyway! The Victoria Falls itself is without doubt the crown jewel and well deserving of its place among the 7 wonders of the natural world. The sheer spectacle of the entire Zambezi River plummeting over 100 metres into the spray belching gorge below is a sight I could never get tired of. Then, to be at the base of the falls at the boiling pot looking up is one of those experiences that makes you feel so small and so alive at the same time!! ANDREW: Standing below Victoria falls always gives me a sense of being. It is raw beauty exposed by centuries of erosion and yet daunting at the same time. You feel very small and the scale of your existence is highlighted. BERTRAND: It was amazing. You can easily forget about the intimidating rapids and heat by just looking around. The scale of the gorge dwarves even the mighty Zambezi rapids. Also the walk in and out really takes its toll in the very hot conditions we had. BRITTANY: BP: The Batoka Gorge is a place I’ve grown up seeing pictures of. It being as far away as it is I wasn’t sure if I would ever get to see it in person. This was a dream come true, Chantelle did such a good job at doing the gorge and the falls justice. Every day I would look to Nadia and say, “Dude, we’re in Zimbabwe!” I never got used to the beauty and I’ve never been so inspired. It’s a wild place. LEON: Being in the Batoka gorge was amazing, it is such a special place, I was humble by the magnitude and beauty of it. It really brought home an added appreciation for the outdoors, the environment and what we need to do to protect it. I felt small in there. NADIA: The Zambezi river is incredible. Its definitely one of the most beautiful rivers I have ever paddled. Right up there with the Grand Canyon. I must have swallowed a bit too much of the water because now its in my blood and I can’t stop thinking about how to get back there. Its a river like no other. 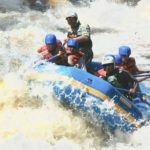 DBP: The Zambezi is famous as one of the world’s most challenging big volume whitewater rivers. Can you briefly describe the process of scouting and deciding what could and couldn’t be run by SUP? 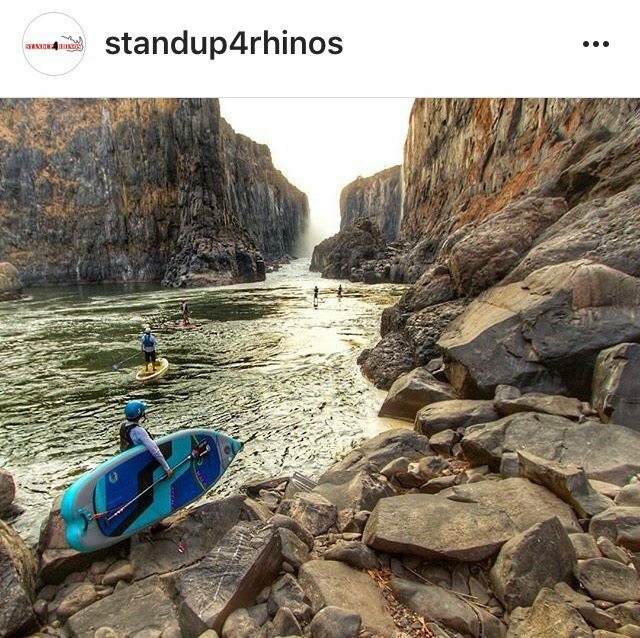 SHANE: It was actually kinda interesting to see a bunch of very competent and in some cases slightly gung-ho kayakers having to take a radically different approach to the rapids of the Zambezi. It was not so much if but when would you end up in the drink and this had a bearing on how we approached the bigger rapids. We found it was best to take a conservative approach in the early stages of a rapid, by dropping to one knee, to have a better chance of still being on the board when reaching the crux move or wave. There really is no substitute for time “in the saddle” and accordingly it was Andrew with the most prior river experience (and a neat little leash trick) that had the most success, followed by the experienced ladies from the US that found the water a bit pushier than they were used to. With my 10 minutes prior SUP experience I was struggling in the first few days but ultimately super stoked with the fast progression to holding my own in the biggest rapids by the end of the mission. I never thought I’d say this but I’m actually looking forward to the next time already!! ANDREW: Scouting a rapid involves identifying hazards and ultimately choosing a line which will give you the best possibility of get through the rapid without danger. Looking through a SUP perspective, it was very different because you had to consider so much more. The more time you in the water the higher the risk of being injured. We were trying to make the rapids clean but we’re also trying to run the big lines which obviously meant more time in the water. Rapid 7 was the only rapid we considered too much of a risk on the day as the levels were super low and there were rocks exposed in our identified line. It is also a long rapid so recovery in the rough water would be near impossible. It is definitely a go at higher levels. BERTRAND: Between the previous knowledge from the kayakers that already ran it a lot as well as scouting by foot and raft scouting on the one day we had a good idea of what was possible. In teh end only three rapids weren’t attempted. As a team a lot of difficult rapids were cleaned. A successful adventure in my books. BRITTANY: Paddling up to a new rapid is a trip. The horizon lines are intense, behind them all you see is whitewater occasionally splashing up and over it. Every new rapid we paddled up to I’d get a little lump in my throat and my legs would get shaky. The Zambezi has quite the reputation and I took that very seriously. Essentially, most of it can be run on a SUP except for three for sure portages. But cleaning them is another story. I was more on the cautious side during this trip. If there was a rapid with high consequence, I would portage. After watching the guys running some of the rapids I chose to portage I feel confidant now that if I go back I could run them. Everyone there had experience with that river besides Nadia and I. It takes me awhile to get to know a river and get comfortable with it. I believe, as a newcomer, not getting too cocky and showing that you respect the river and her power is important. NADIA: Having no prior knowledge of the river I left a lot of the decision make to what we would try or not to the paddlers with more experience with the Zambezi. There were a few rapids that I just didn’t have a good feeling about and decided to walk. With one more week on the river I might have decided to give them a try. Maybe next time. DBP: Everyone loves a good tale of WALLACE!! What was yours on the Zambezi? SHANE: My most notable beatering came on the final day – the second to last rapid of the mission. An unusually chilly thunderstorm rolled through the gorge, as we were scouting rapid number 8, which had us scurrying for cover. After 20 minutes or so in hiding, it passed and we could complete the scout of the rapid known as The Midnight Diner, featuring a nasty, rocky “chicken run” on the far right, the Mighty Muncher wave in the centre which stops, surfs and flips an 18 foot raft like a McD’s burger patty, and my personal favourite “Startrek” on the left. Startrek is a 10 foot foampile which will cartwheel a kayak 30 feet to the right until you exit at the Mighty Muncher wave…. it’s a fun ride of galactic proportions! On my lead-in I got tripped up by a strong boil line which put me in the water. I clambered back onto the board and was half way up from my knees to being back on my feet when I slammed into Startrek… broadside! The beatering was biblical as I got bent over backwards like a celestial taco… it was probably the only moment on the entire mission where the words “well that wasn’t fun” floated briefly through my water logged mind. PAUL: I fell off the board in a small no name rapid on the second day of the project while we were still orienting ourselves and got sucked down for ages…..after a while when the lack of air became uncomfortable I decided it was time to make a proactive attempt at reaching the surface and started to climb my leash which was slipping through my hands. I managed to wrap the leash around my hand as I climbed and took a huge gasp of air… as I surfaced only to waste that breath on exclaiming how crappy my downtime was to Brittany as she floated by somewhat unimpressed. BERTRAND: At rapid number 13 (The Mother) I went in the drink after punching a wave and went for some downtime. In all previous swims that was fine, just pull on the leash and the 300litres of air in the SUP helps to surface quickly. I tried to do just that and realised my leash was not there. My first thought was that it snapped swimming through a wave. I did feel a big tug at one stage. In the end I swam out in a big pool below Jailhouse eddy. I had to rock climb back to Jailhouse to retrieve my board that was stuck there. On closer inspection my leash was intact and my quick release open. I must have either caught the quick release buckle on the board when I came off or before 12 getting on the board. Needless to say for the next few days I checked my quick release buckle before every rapid. BRITTANY: HA! Big wipeout, I mean I swam A LOT! But my idea of a big wipeout is getting significant downtime, ramming into rocks, shedding blood, that kind of thing. I’m happy to say I had no close calls and came out rather unscathed. With that said, everyone jumped into the raft for rapid #7, it’s a long one with some big holes and technical moves (very tricky on a SUP). Nadia, Andrew, Paul, and myself were sitting up front. The rest were in the back sitting on top of a pile of boards. We went right into the meat of everything on that rapid and at one point the raft was so submerged I didn’t even think I was in it anymore. I thought I was swimming. Nadia was next to me pushing me down into the raft. It was mental!!! We all made it out though with no swimmers; our guide Mfundisi was a total legend. LEON: Just lots of swims. Getting tangled in the leash and surfacing under the board was not fun. I got a proper beating the day we scouted the 1-11 main gorge section.I was kayaking, probably started daydreaming about supping clean lines… then got whipped quite quickly in a hole and popped a shoulder, followed by a swim and some underwaterness. That was the end of my paddling for the trip. Humbling. NADIA: On rapid 15 there is a monster of a pour over. The first time I ran this rapid I cleaned it, punching the right lateral early in the rapid. The second time I guess I was a bit too confident and ran it further center. I swam, threw my paddle, and started swimming as hard as I could right. Paul threw me a rope that I didn’t see. I looked up and saw I was heading straight for the pour over. I took my knees to my chest and balled up as tight as I could as I came over the lip. I went really deep, all the while hoping not to see the aerated white wash of the recirculating water. About 30 ft downstream I popped up laughing. ANDREW: I ran number 18 three time. This rapid is know for epic raft surfs and flips and is huge. The entry is not the easiest and the thought of swimming through the hole with a board attached to you is not that exciting. On my third run the lateral coming in from the left back surged and dumped me in the water on the wave leading up to Oblivion. My paddle made contact with rock and then my foot skimmed over before being blasted by the the deep hole. The board got caught and I was tugged underwater in the full flow of the river for a couple of seconds. As I was about pull my quick release buckle to dump the board I felt the pressure subside. Back on the bank I stared at my buckled and creased paddle and knew who was in charge. DBP: Thanks to you all, not only for your time, but for the courage to take on the mission and the heart to help the rhinos. What lasting memory did you take away from the Standup4Rhinos adventure that you’ll never forget? 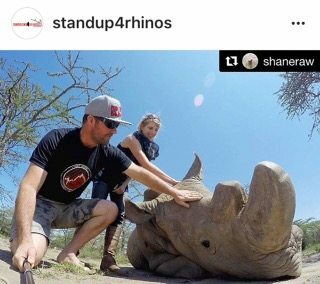 SHANE: Not so much a memory but a sobering thought that haunts me daily… there are so many bad decisions being made in Africa (and many other places in the world) which result in our natural heritage being damaged or destroyed forever, and not enough is being done to stop it. 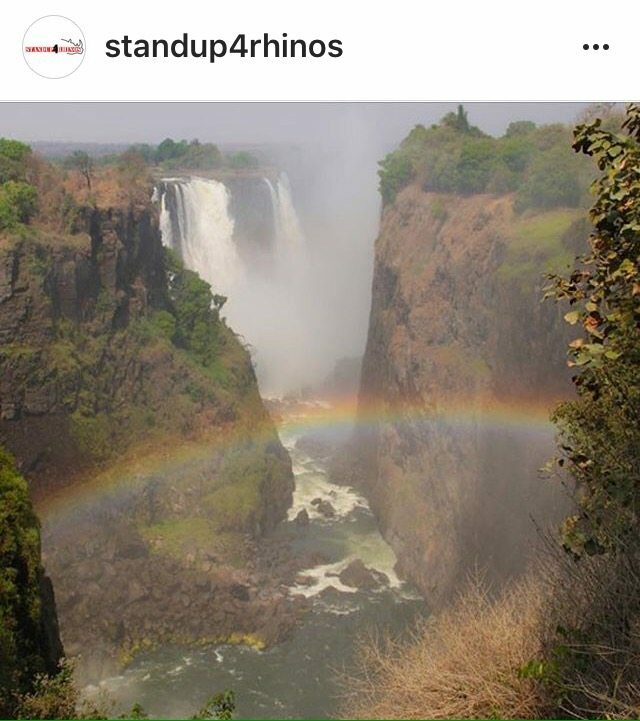 Whether it’s the elephants and rhinos that are being slaughtered to supply a bogus and illegal trade in the Far East or the fact that in 2017, construction will start on a dam wall 50 km downstream from Victoria Falls that will flood the entire Batoka Gorge and drown the rapids of the mighty Zambezi forever! What an absolute tragedy this will be, especially when you consider that the whole justification for the dam – the production of hydro-electricity – has been proven to be less cost effective than other available methods, not to mention the devastating environmental impact.There are other, more efficient and environment friendly ways of producing electricity – for example, Southern Africa is one of the best locations on the planet for solar generated power. I still hold onto the hope that sanity will prevail but right now the rapids of the Zambezi should also be listed as a critically endangered species! 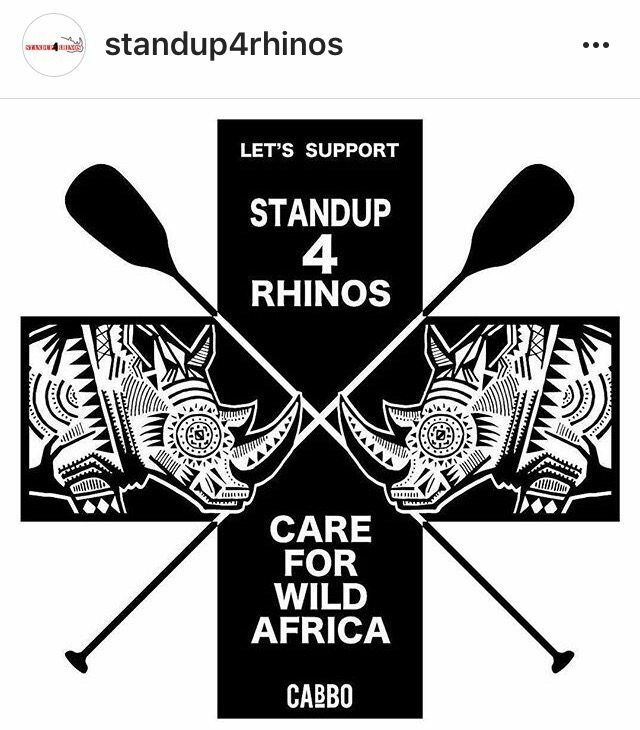 ANDREW: It was good to have a project to give the paddlers focus and being deep in the heart of Africa the synergy with Rhino orphans was a good one. The challenge of SUPing the rapids below Victoria Falls was very real and there are stand out moments in the expedition which will forever be with me, none more that the silence amongst the paddles sitting in the boiling pot above rapid 1. BRITTANY: DBP thank you for helping us spread the word and raise money for this cause. That adventure was full of so many memorable moments. I loved how wild it all felt. Between the crocodiles, elephants, hiking in and out of the gorge in 110 degrees, and listening to the hyenas at night… I’ve never been somewhere that felt so alive. It felt like a place you could get in touch with your primal self and the natural world. It’s a place of wonder and I plan on going back regularly. NADIA: Love all these guys. I’ll will definitely be making a trip back to paddle with them on the Zambezi and to other rivers. PAUL: If you put good people on a team with a common purpose to achieve something for something greater than themselves….then anything is possible. REMEMBERING JAMIE PAGE ~ The Greatest Gift is Love and Friendship. by Alex Wilson & Mike Toughill.